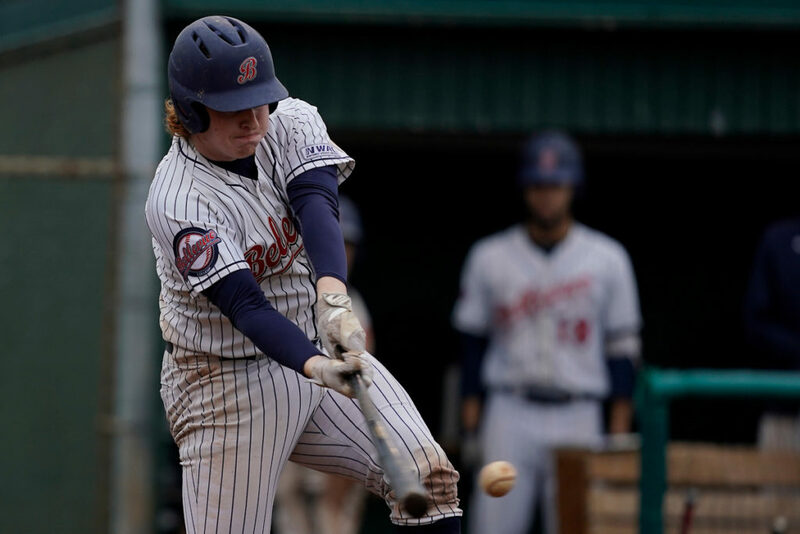 Bellevue College baseball bounced back from a rough series last weekend to win three of four games against Lane (OR). The Bulldogs hosted all four games after playing the Titans seven times in Eugene last year. Bellevue was able to reclaim some degree of pride after losing all four to Lane at this time last year in addition to being knocked out of the playoffs by the very same team in late May. Last night, Nick Miller led Bellevue in game one with an impressive shutout through seven innings. He scattered only four hits while striking out seven. Warren Utschinski picked up the save with two shutout innings. Lukas Motta’s suicide squeeze scored Nick Hovland with the game-winner in the fifth. Hovland had two hits in what would be a memorable weekend for the freshman third baseman. In game two, Hovland hit his first career homer off the scoreboard in the second to stake Bellevue a 6-0 lead for spot starter Eric Anderson, who took the place of injured Michael Attalah in this weekend’s rotation. Hovland finished 3-for-4 with 3 RBI’s in the nightcap. Ian Haigh had a turnaround performance on the mound. After struggling with control problems throughout the pre-season, Haigh went three innings while walking only one and striking out six. In game three, starter Jared Maxfield struggled with command, surrendering a triple and three doubles in the first to spot Lane a 3-0 lead that ultimately cost Bellevue. After tying the game at 4-4, the Bulldogs had their chance down 5-4 in the eighth after loading the bases with consecutive walks to Al Aurelio and Dom Marinez followed by yet another hit by Hovland. A strikeout and two straight fly outs quickly deflated Bellevue’s hope. In game four which was a seven-inning contest to assist Lane’s travel home to Eugene, Brock Hathaway tossed his second consecutive gem in two weeks. Hathaway unfortunately got a no decision, as Mack Mahovlich was the hero in the series finale in a game in which the Bulldogs came back late to tie and ultimately win the game and series. Mahovlich greeted Lane relief ace, Matt Dallas, with an opposite field double off the wall to score Hovland to tie the game in the sixth. Then in the seventh, the drama unfolded as Garrett Gants delivered a single to start things off for the Bulldogs. Ethan Smith would follow with a single putting runners at the corners. In a bold move, Lane elected to intentionally walk Kye Seitz, one of Bellevue’s top hitters, to face the dogs’ hottest hitter over the weekend in Hovland. The move paid off as Hovland struck out. The luck would run out for the Titans though moments later, as Mahovlich delivered a two-out bloop single to score the walk-off winner. Bellevue is now 8-5 and play their final pre-season set next Saturday March 23 at Walla Walla (11:00 a.m. start) before finishing up the road trip with a doubleheader at Columbia Basin in Pasco on Sunday. Due to persistent snow in Eastern Washington, field conditions are currently unplayable but are expected to thaw out in time for the Bulldogs’ series. Fans are advised to hold off until Wednesday March 20 to arrange travel plans in case the games are moved to a neutral site or possibly flipped to Bellevue for the weekend.